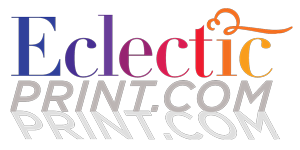 Eclectic Print is an extension of our work in the art and printing industry. We have come across many art works and graphics that we thought would make excellent posters. Eclectic Print has greatly simplified the process by offering limited sizes and paper choices for our posters. You have a choice of your posters being printed on high quality gloss or matte finish durable 80# poster paper. We ship all posters via USPS Priority Mail to keep our packing and shipping cost as low as possible.